Originally designed and developed by Nigel Alderton for the ZX Spectrum in 1983. Converted for the Acorn BBC Micro in 1983 and Acorn Electron in 1984 by Doug Anderson; for the Dragon 32/64 computers by Martin Webb in 1983; for the Commodore 64 by Sean Townsend and Martin Webb in 1984; for the MSX (and some of its clones) by A&F's "R&D team" in 1984; for the Amstrad CPC by Nigel Alderton in 1985; for the Atari 8-bit computers by Sean Townsend in 1985; for the Commodore Amiga and Atari ST by Icon Design Ltd with music by Tony Williams for Sound Images, and published by Pick and Choose in 1988; and for the IBM-PC compatibles by M.C. Lothlorien: Programming by Ste Cork, graphics by Anthony Anderson and Martin Holland, and music by Tony Williams. Published by Pick and Choose in 1989. 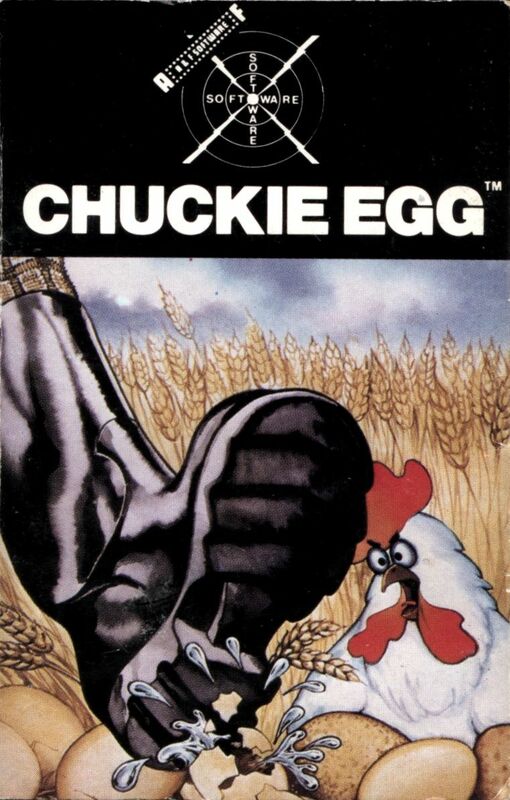 Judging by the amount of ports released of Chuckie Egg, you can see that a proper classic is in question here. The number of versions doesn't necessarily mean that the comparison must be stupendously large, as has been customary, because this is one of those old games that can be dealt with relatively quickly. I remember someone having made a request of this one a long time ago, but I have no recollection whom it came from, but I'm sure Chuckie Egg is classic enough to be on the list of comparisons that I simply must do, since it's possible... at least for the most part. 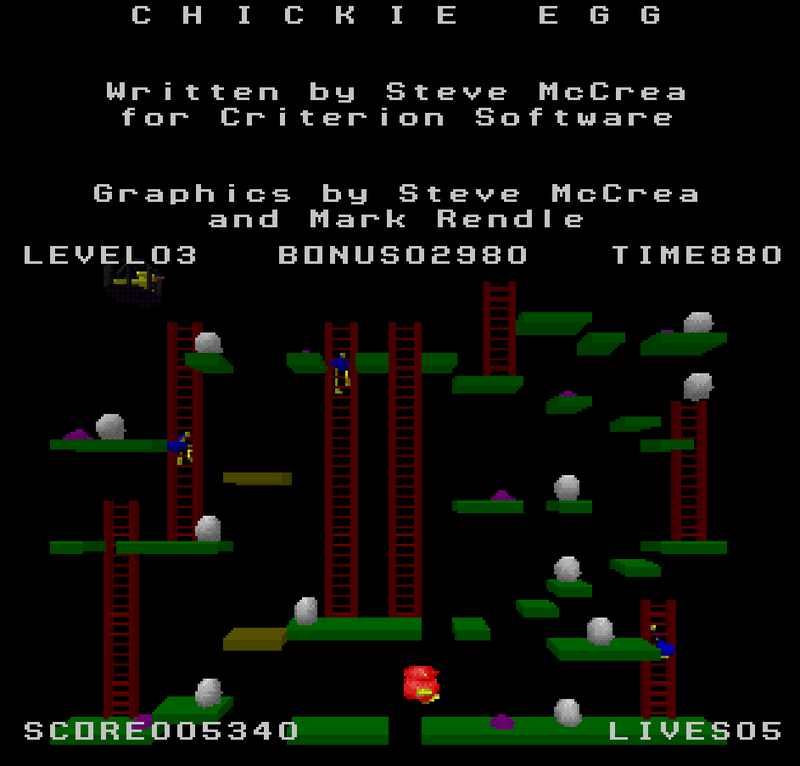 To be honest, I never found Chuckie Egg quite as encaptivating as most old-timers make it sound, probably because I was more hooked on more fantastical renditions of similar gameplay ideas, such as were represented by games like Miner 2049'er, Manic Miner, Donkey Kong and its sequels, and so on. Besides, my introduction to Chuckie Egg came a bit too late in my life as a gamer, so the impact of it on me was kind of muffled at the time. 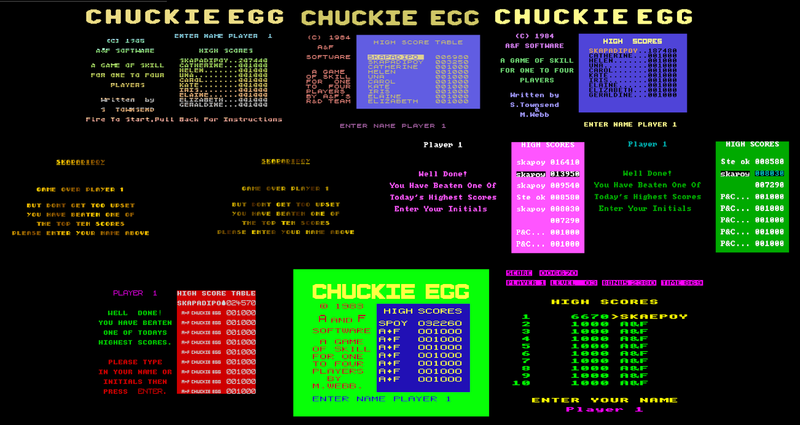 Of course, my personal history with the game is not important, since it actually did have some sort of an impact at the time of release, and Chuckie Egg is actually often seen credited as one of the titles that helped develop and popularise the platform genre, alongside Miner 2049'er and Lode Runner. At the moment, the original version has a very respectable score of 8.26 from 408 votes at the World of Spectrum website, while its most immediate conversions for the Acorn and Dragon computers have no trustworthy scores to be found anywhere. 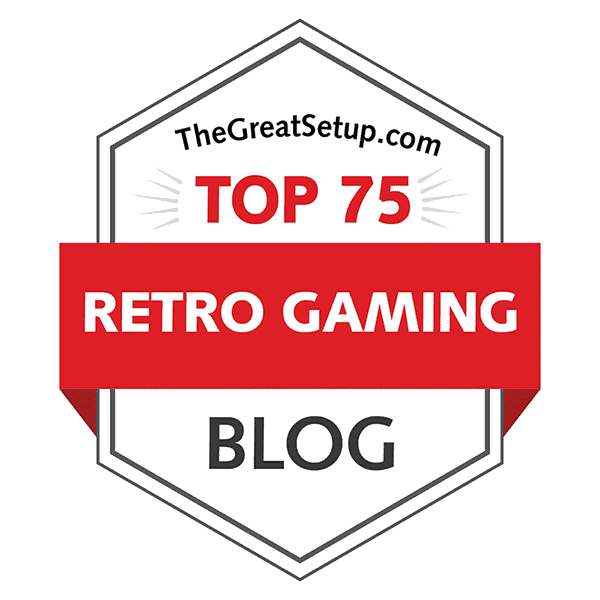 Next, the Commodore 64 conversion has a fair 7.4 from 47 votes at Lemon64, and the MSX version has 3.5 stars out of 5 from 43 votes at Generation-MSX. For the Amstrad conversion, once again we have two scores: at CPC-Softs, the score appears to be 15.17/20.00, and at CPC Game Reviews, the given score is 8 out of 10. At Atarimania, the 8-bit version has a rating of 7.2 from 42 votes, and the 16-bit version only has one vote that gave it a 7. The score at LemonAmiga, which is 4.5 from 16 votes, could be a bit more reliable, though. Finally, the DOS version has four stars out of five at My Abandonware, so it shall be an interesting ordeal to find out how the versions actually compare. 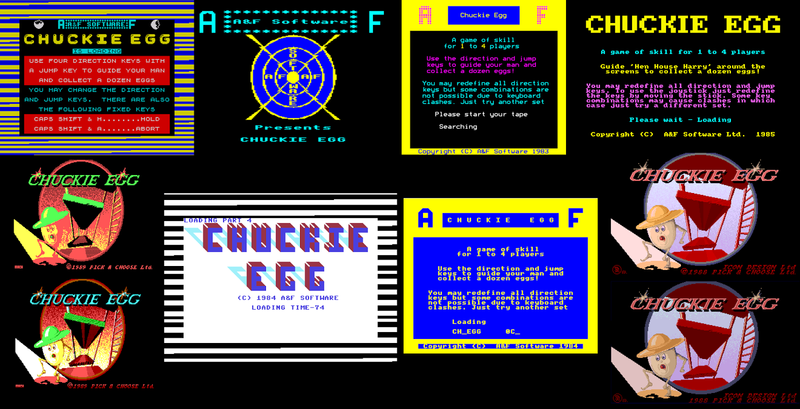 There is no other way to put it: Chuckie Egg is a single-screen platformer, sort of like the aforementioned Miner 2049'er, or the arguably even more legendary Manic Miner that was released a few months prior. But it would be very remiss of me not to mention Donkey Kong and Space Panic as the genre's true initiators. Anyhow, there is a good reason why Chuckie Egg holds such an importance in gaming history - but I daresay it has less to do with the actual gameplay than it should. It is similar enough to the aforementioned platformers to make very little difference in that sense. 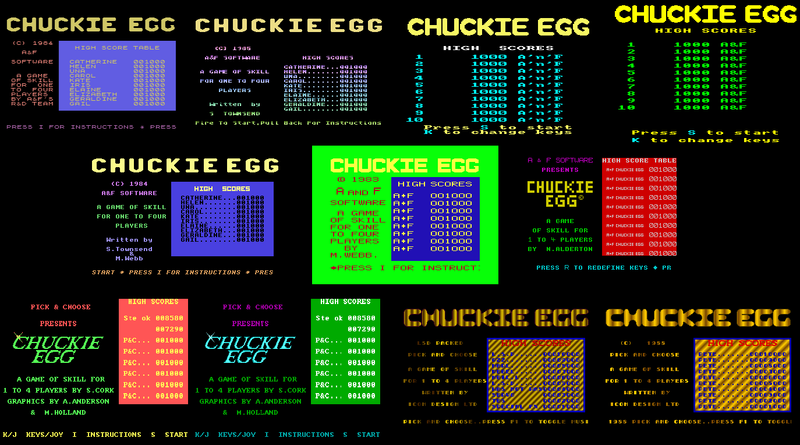 From what I've gathered, the important thing about Chuckie Egg is that it was designed for computers with lower hardware specifications, and the relative simplicity of it allowed some freedom for modification. And really, the impact of the game is a bit limited, since it became such a cult classic mostly due to it being spread in British schools due to their heavy utilisation of Acorn's BBC Micros, and Chuckie Egg was apparently often found in these machines. But that's neither here nor there, because that's not what the actual game is really about. Your mission as Hen-House Harry is to gather all twelve eggs from each of the game's eight screens, while avoiding contact with the roaming hens. Each level is made of solid platforms, a bunch of ladders and occasional lift platforms, that move constantly upwards until it reaches the top of the screen and loops back from the bottom. The game has a time limit, within which you are supposed to collect all the eggs, but there are also piles of birdseed you can collect, which stop the timer for a while. Mind you, the hens are also able to eat the birdseed, so you have to keep an eye on the timer - at least later on. While landing on a platform from a big drop doesn't harm you, the hens will, as will a fall to the very bottom of the screen, and riding the lift to the top of the screen will squish you to the ceiling. Apart from having plenty of consecutive raises in difficulty level, the game is basically the same thing over and over again, as you would expect from this sort of a thing. But it is highly playable, unlike too many others of its kind - only the real classics are able to reach this level. And curiously, the game has two distinctly different versions: one with more realistic physics, and one with less realistic. We shall get into that a bit later on, but it should be said, that while Chuckie Egg is definitely a simple single-screen platformer, it has earned its classic status due to a very high playability, and everyone with any interest in gaming history should have a go at it. Unsurprisingly, the Atari version takes the longest to load, but what is surprising is that how close to each other all the rest are. Depending on whether the MSX version loads at 1200 baud or 2400 baud, it's either that one or the C64 tape that is the next slowest, and the quickest version is then also either the MSX version or the DRAGON version - I have no true knowledge of this matter, I'm just using tools to make measured guesses now. At least, when loading on an emulator, the MSX version loads up in 2400 baud mode. But still, between the Dragon version and the C64 version, all the others fall between that one minute's timeframe in loading. Loading screens. Top row, left to right: ZX Spectrum, Acorn BBC Micro (2 screens), Amstrad CPC. Commodore Amiga (right top) and Atari ST (right bottom). I don't know what I was expecting in regards to the loading screens, but I wasn't expecting quite this. Naturally, the 8-bit ATARI version has none, but so is the case for the MSX and DRAGON versions. Instead, the BBC MICRO version has two loading screens - one which you need to stop the tape for and wait for a bit of drawing and animation to happen, and then the instructionary loading screen kicks in. From the 8-bits that actually have a loading screen, only the C64 version features no instructions, and the game title's basic styling attempt is cute, but ugly, like something a 3-year old would do, but at least the screen has a loading time counter. And of course, the 16-bit loading screens are completely new and fancy with 16-bit graphics. Before I move on to something of actual worth here, it should probably be noted, that when it comes to emulation, the MSX tape version doesn't work with blueMSX, but instead needs to be loaded with a substantially more accurate emulator, such as openMSX. Chuckie Egg is a platformer from the time of all the great original platformers, so there is nothing difficult about its controls. All the versions share the ability to change your controls, in case you're not comfortable with the default ones, but whatever the case, the chosen left and right directions make Harry walk left and right, and up and down will make him climb ladders whenever placed near enough one. The chosen fire button will make Harry jump on spot, or if you're walking in some direction simultaneously, he will jump into that direction. There is something about Chuckie Egg that feels rather advanced, though: you can latch onto a ladder from mid-jump, and you can also jump off a ladder at any spot you wish to, provided that you don't want to jump from the very top of the ladder, because Harry's ability to climb ladders stops when his hands touch the top of the ladder. Of course, this is only logical, but old platformers rarely have anything to do with realism. Also worth noting is, that when you jump into some direction and other platforms are in your way, you will bounce off instead of fall straight down or continue the jump through the said platform. There is no need to explain the basic idea of the game here, since the whole thing has already been dealt with in the Description section. So proceeding from there, once you have completed your first run of the eight screens, the duck that was locked inside the cage for the first run will be freed, and you will be pursued by it - and the platforms will not affect its course. At least the hens will not be pursuing you on the second run. After the second completion, though, both the hens and the duck will be after you. After the third completion, more hens will invade the screen. After the fourth completion comes the final loop where anything happens with your enemies, after which the game loops the final loop over and over until your Game is Over. The final notable loop makes the duck and the hens move at a faster speed. Reportedly, the only thing that happens after the final notable loop is that the timer starts off with progressively less time until you reach the eighth loop, after which all the subsequent loops start with the same settings as the last loop thus far. Now, as it could be difficult to compare the differences by features, since there are 11+ officially released versions out there, I'm going to have to do this by starting with the one released first, and write my observations as I go. feature to toggle music in the main menu by pressing F1. After having pressed 'S' or, depending on the version, the fire button to start the game, you get a choice to choose from 1 to 4 players; the players will take turns, if you choose more than one. Only the C64 version gives you an additional option to choose the difficulty level from six levels, as well as the option to use a joystick without having to bother with the key controls prior to pressing 'S' in the title screen. At last, we get into the game itself. The most obvious differences are in the level layouts and the game speed - more particularly the speed differences between Hen-House Harry and his adversaries. Unfortunately, there is no reliable method to measuring the running and walking speeds of Harry and the hens, because the game's graphics vary wildly between certain versions, forcing the level layouts to be considerably different occasionally, so I have had to make some experimentations and guesstimate based on those experiments. Generally, the 16-bit versions are the fastest ones of the lot, and the AMIGA and ST versions have the biggest difference between Harry's running speed and the hens' walking speed. In the DOS version, the hens walk almost as quickly as Harry runs. From the 8-bits, the SPECTRUM, MSX, C64 and ATARI versions feature similar speed differences for Harry and the hens, but each version features an overall different speed, the MSX version by default being the quickest of the lot, closely followed by the original SPECTRUM version, and then notably slower, the ATARI version. Uniquely, the C64 version can boast with having six different difficulty settings, which actually determine the game speed - #1 being the slowest, #3 being closest to the original, and #6 being stupidly quick. As such, the C64 version can easily be considered the most balanced version of them all, since it offers so many speed settings. Also, the SPECTRUM version suffers from slight slowdown from jumping, which is strange, considering the relative simplicity of the game and particularly as none of the other versions feature this inconvenience. The final four - AMSTRAD, DRAGON and the two ACORN computers - have the hens' walking speed taken down considerably, and so the game balance has been changed notably while at it. Aside from the DRAGON version, though, this change is almost understandable, since the graphics are so wide that the level layouts have had to have been altered quite notably from the original. Another thing worth noting is that the lifts move at different speeds and in different ways in different versions. In the original SPECTRUM version, they slide smoothly and rather quickly - it takes them 25 time units in the game to make a full loop. On the C64, the loop is much slower at about 40 time units, even at the "as it should be" speed level, and the lifts make visible nudges on the move. In the MSX version, the lifts are about as quick as they get - 20 time units for a loop. Then again, in the DRAGON version, it takes 17 time units for the lifts to loop, but it doesn't feel as quick as that. This, I suspect, has a lot to do with the game's internal clock being a bit on the slow side compared to the others. While the lifts on the AMSTRAD version only take 21 time units to loop, they don't appear quite as quick as that. This, I suspect, has a lot to do with the game's graphics, but at least they run smooth. Exactly related to the graphics, the two ACORN versions have more screen height, so it takes a bit longer for the lifts to loop - about 26 or 27 time units, I think. The lifts on the 8-BIT ATARI version have a similar speed to the AMSTRAD version, but they have been set apart to be almost exactly half-way from the loop point, instead of just about two Harry's heights, like they usually are. In the AMIGA and ST versions, the lifts move about the same speed as they do in the MSX version, although with the higher overall speed (yes, the timer runs faster, just as everything else does), the difference is quite notable. Seeing as the components of your (virtual) DOS-based machine can radically affect the game speed, I would suggest you go with a basic EGA-based machine emulation and turn the emulation speed down a notch, so you can actually react to things better. Having done so much, it's easier to see that the lifts run their loop in about 30 time units in the DOS version. 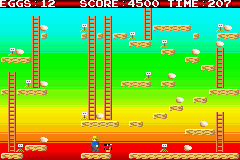 As a small curiosity, which might prove to be crucial to your gaming experience: in the SPECTRUM and C64 versions, the game allows you to jump on board lifts slightly late, and Harry will catch onto it, whereas in all the other versions, if you don't land your jump firmly on the lift, you will fall down through it. It's not much, but it's certainly something that can split the versions into two basic categories. According to Wikipedia, some versions of Chuckie Egg have "realistic" physics, while others don't. Having played the game for more hours than I care to admit up to this point, I hadn't been able to find out, what was the implied "realism" all about, so I googled it up. I found out that some other gamer was attempting to find the truth behind this mystery, and while some people claim that it had to do with your ability to change direction mid-jump in the "unrealistic" versions, it seems really that the only thing that any of the versions have to do with "realistic" physics is that in the "less realistic" versions, Harry's jumps have a triangular form, and in the "more realistic" versions, Harry's jumps have a more rounded form. This affects the gameplay in no way whatsoever, and anyone who says it does has to be full of themselves. Myth busted. Having said all that, the DRAGON version has a shorter jump range than in any other version, thus creating a vast difference of gameplay balance for it. As for other strange anomalies that can be only found in one version: there are places in the DOS version, where the ladders shouldn't (and don't, really) reach the platform directly above, but you can jump onto the platform from the top of the ladder below it. This isn't possible in any other version. The DOS version also has some of the hens placed in places they normally wouldn't occupy in other versions, and unlike in all the other versions, here the hens actually move very randomly, thus necessitating drastic changes in strategy. Also, in DOS and MSX conversions, picking up the corn bits do not stop the timer for a few seconds, like it does in all the other versions, although they still give you the extra score. Another anomaly in the MSX conversion is a real game-killer, seeing as the lifts are a rather pivotal part of the whole game from level 3 onwards: you have to jump off the lifts from an exact spot, very close to the edge, because otherwise the jump will not register. This can often prove to be a fatal flaw, and this is the biggest reason why you should play the MSX version through emulation. Also, the openMSX emulator doesn't seem to feature savestates, which is really a fatal design flaw in any emulator, but there is another quite peculiar feature in the emulator - it counts the time of your game, and you can actually rewind to a certain point in the timeline and continue playing from there, which is how I eventually got through the first loop of eight levels. The behaviour of the duck once it has been let loose is the final thing I will be concentrating on before I wrap this section up. Basically, the duck acts like a slow homing missile of sorts, and in most cases, it's fairly rounded in its movements. The best strategy to survive the duck's attacks would be to stay still until it's only a few "steps" away from you, and then run away from it like a maniac, because the duck's turning circle is fairly large, and it takes a bit of time for it to get back properly on your scent, for the lack of a better word. On SPECTRUM, the duck takes off with notable acceleration, but doesn't move faster than about eight to ten pixels per half a second, which should give you plenty enough of time to maneouver yourself around the duck's paths. The duck's speed in the ACORN and AMSTRAD versions is difficult to compare to the originals due to the wider pixels, but I would guess they're pretty similar - although, perhaps the speed of the duck feels more threatening due to less movement space on the screen. The DRAGON version of the duck feels a bit slower than the original, as it moves in smaller steps but at a similar pace, but then so does Harry, so it's balanced okay. On C64, the duck moves smoothly, so it feels a bit slower than in the original, although it really isn't. Due to the smoothness of the duck's movements, it's easier to tell, where it's going to move at any given moment. The 8-BIT ATARI version of the duck moves as smoothly as the C64 duck, but its reaction time to your movements is much longer, and it also feels slightly slower than the other ducks, although that might have something to do with the relative overall slowness of the Atari version. The duck on the AMIGA and ST versions moves around as choppily as it does in most of the 8-bit versions, only here it has a more determined aim at you, moves slightly quicker, and takes less time to turn around when you pass it. Finally, the duck in the MSX version moves smoothly, but as quickly and determinedly as on the 16-bits. I don't really think anyone who has ever commented on the MSX version being the best one around has even played the game so far as to notice the problem with the lifts. But then, it seems that games are all too rarely judged by their playability. The same thing goes for the DOS version - I have only been able to get as far as level 6 in it due to bad changes in level design and hen placement. But since the duck's movement is not as important as getting through at least the first run of the game's eight levels, I'm going to have to take some points off of the versions, where such achievement is made unnecessarily difficult compared to the original. All in all, it's a surprisingly diverse bunch of versions of such a simple game we have here. Putting all these eleven versions in some sort of an order shouldn't be such a difficult job, then, but it's not as simple as one might suspect, either. The speed adjustment options in the C64 version is something that people rarely appear to take into account, when making their preferences known, and I would say that without actually having tried all the speed settings out myself, I might have agreed with the common misconception that the C64 version is too slow to be called comfortable. The trick is, of course, to choose the most suitable speed for you. The only thing I'm not comfortable with in the C64 version is the slowness of the lifts, but otherwise, I'd say it's the best one around. Without the C64's speed settings, though, all the other versions are on the same starting line, and from that line, the SPECTRUM has the most optimal version - apart from slight slowdown when jumping, the general game speed is spot on, the controls are as responsive as they should be, and the slightly late jumping on the lifts is helpful. The DRAGON version is not only slower than necessary, but Harry jumps too short, and all your adversaries move around slower than they should. The MSX version would be otherwise brilliant - even better than the original, but there are some rather unfortunate bugs in the game that render it practically unplayable from a certain point onwards. Despite the slightly redesigned level layouts, the two ACORN versions and the AMSTRAD version play remarkably well, and apart from the slight inconvenience of slower hens, I have nothing to complain about. On the 8-BIT ATARI, the general slowness makes it a bit boring to play, and the slightly redesigned levels require some new strategies, but it's not too bad. Certainly, it's better than the supercharged 16-bit versions, which are almost impossible to play once the levels get really busy, but even the AMIGA and ST fare much better than the faulty MSX and DOS versions. The DOS version is easily the worst of the lot, with its sloppy level design and badly replaced hens. The sad thing about making a comparison of a game that was born on the 8-bits and even perfected there to a certain extent, is that some aspects of it will most likely be enhanced a great deal, when it gets to the 16-bits. Whether or not these new graphics are more charming and suited to each individual's liking than the original is another matter entirely, but unfortunately, there is also the technical side of the matter that must be taken into consideration. This is one of those occasions I wish I wasn't so strict about simply comparing artwork regardless of the platform, but I can't help playing by the rules I set when this blog was launched. So, if you're not happy about the 16-bits with 256 colours of hi-res graphics winning over arguably more charming 8-bit graphics with wide pixels and about 5 different colours in use at once, blame it on the original graphician for not making more technically impressive graphics in the first place. Title screens. Top row, left to right: MSX, Atari 8-bit, Amstrad CPC, Acorn BBC Micro/Electron. Middle row, left to right: Commodore 64, Dragon 32/64, ZX Spectrum. Bottom row, left to right: DOS CGA, DOS EGA, Atari ST, Commodore Amiga. Obviously, we shall start from the title screens. Although it's all basically just text here, some versions use plenty of colour to make the title screen look a little more inviting and designed. Apart from the often boxed high scores table, the only really graphically designed thing on the screen is the title logo. Strangely enough, the only version that keeps the logo similarly styled on both loading screen and title screen is the DOS version, which differs the most drastically in design from the others. In most other versions, the title logo is written in big, more or less rounded yellow letters. Only the original SPECTRUM version has the title screen logo drawn in a simpler style, although the loading screen showed a similarly rounded title as are featured in all the other 8-bit versions, as well as the AMIGA and ST versions. Speaking of which, they give us the perfect proof of too much visual effects being able to ruin the whole screen, particularly the ST version, in which the gradient lining is more extreme and narrow. Another thing worth noting is, that the AMSTRAD and ACORN versions are only able to show the high scores in the title screen due to the wide font, but the instructions are shown after a brief demonstration of the game. I was about to show you the screenshots for instructions and key selections, but decided against it, because they offer no graphics of worth whatsoever - at least, nothing you wouldn't be seeing in the game. In most versions, you will only be shown plenty of text for these sections, but the only two versions that feature anything particularly differing from the others are the SPECTRUM and C64 versions. On the C64, you can see some bits of information having a visual aid, such as an egg shown next to the word 'egg' and the sprite of Hen-House Harry shown next to the text. The SPECTRUM version features a red filled rectangle with the controls shown within, but nothing of real graphical value. The obligatory "Get Ready" screens. Top left: Dragon 32/64. Top middle and right: ZX Spectrum. Bottom left, top to bottom: Amstrad CPC, Acorn BBC Micro/Electron, Commodore 64. Bottom right, top to bottom: Atari ST, Commodore Amiga, Atari 8-bit, DOS EGA and CGA. There is something very unique, and worth mentioning about the SPECTRUM version, though - the inevitable "Get Ready" screen is a small and colourful animated little thing with four rectangles filling up the screen and then retreating the same way they entered. The bigger colourful rectangular thing you see next to it in the above picture is shown at the very beginning and the end of each played game, and it has a similar animation sequence. The only other version that has anything resembling an animation is, quite surprisingly, the DRAGON version, which has the level screen scrolling up from the bottom. All the other versions have some sort of basic text-based "Get Ready, Player 1" thing going on, each more predictable than the other. Screenshots from level 1. Top row, left to right: MSX, ZX Spectrum, Commodore Amiga, Atari ST.
Middle row, left to right: Commodore 64, Dragon 32/64, Atari 8-bit, DOS CGA. Bottom row, left to right: Acorn BBC Micro, Amstrad CPC, Acorn Electron, DOS EGA. Here we have Level 1 shown from the very beginning of it, at least as far as the player's position goes. Although I have clearly failed to take all the screenshots from the exact same point in time, it's not one of the more important issues here. This picture only serves as a starting point, to show all the versions in one big collage, and more examples of level graphics will come as platform-specific pictures. To start the in-game graphics comparison properly, let's examine the colours. The original version has all the platforms green and tile-based, and the ladders are by contrast a fairly loud purple. Harry is monochrome yellow, as is the mother duck and her cage, while the hens are cyan, and of course, the eggs are white as they should be. The lifts' colour is yellow, to get around the colour clash problem, which would look more awkward on the lifts that in all the other places in the game, and they are shaped like flat boxes with no other distinctive features. Only the piles of corn look a bit weird in purple, but that's not really something you would necessarily think about when playing for the first time without having read the instructions. The info panel has been stylised to display all bits of text separately with a red background and white text, which looks a bit weird, but it doesn't really irritate you either. Also, Harry's number of lives are indicated as little yellow hats. Screenshots from the Amstrad CPC (top row) and Acorn BBC Micro (bottom row) versions. Now, only the versions for the two ACORN computers and the AMSTRAD CPC follow this colouring as far as necessary - the background colour for the info panel texts is purple in all three, the eggs are yellow on the ACORN versions, the corn piles are red on the AMSTRAD, and the hens are purple on the ELECTRON. 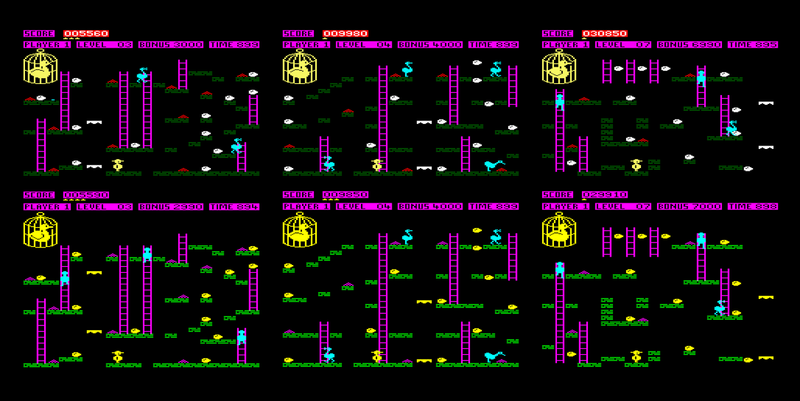 The lifts are shaped a bit differently here, with some sort of dentage at the bottom of them, but both ACORN and AMSTRAD versions have the lifts follow the colour of the eggs, for some peculiar reason. Although it doesn't look like much, even by 1984 standards, the simplicity and the greatly contrasting colours makes plenty of sense. Screenshots from the Dragon 32/64 version. Next in line, the DRAGON version has a constant ugly green background, and every colour feels a bit off - with a black background, it would look tolerable, even if still quite different from the original. At least Harry has been made into a multi-coloured sprite now, but then again, he doesn't look like himself anymore. Somehow, Hen-House Harry has managed to personify into this monochrome little pudgy man with a large hat. Also, the lifts are multi-coloured, with red and blue horizontal stripes on them, but no weird shaping this time. Screenshots from the Commodore 64 (top row) and MSX (bottom row) versions. On the C64 and MSX versions, you get the same blue ladders from the Dragon version, but the background is thankfully black again. Also, Harry is a multi-coloured again, but for both MSX and C64, he has been made to look entirely different. I think the MSX version of Harry actually looks rather fitting, just like a fully coloured version of him would. On the C64, he is made of wider pixels, and his colours are about as dark as in the Dragon version, so he looks a bit awkward. One thing the C64 version has as a unique element is that the hens are of different colours, which isn't exactly realistic, but it's nice to look at, compared to the dark blue hens on MSX, which don't work well with the similarly coloured ladders. At least the lifts are nicely bright cyan on the MSX, and similarly shaped as on the SPECTRUM. Other curious colour choices on the C64 version are the brown eggs (although to be fair, there are brown eggs in real life, so why not here), the orange lift (which is also comparatively flat), and the lack of background colour changes for the info panel. Screenshots from the Atari 8-bit version. 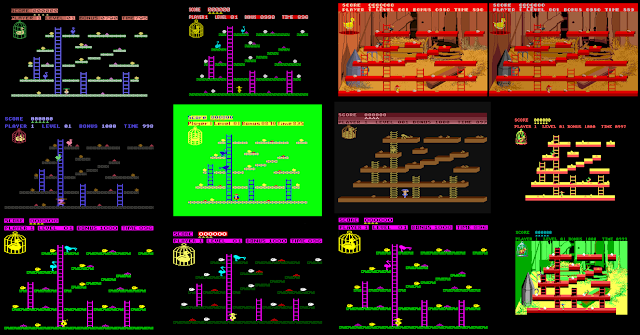 Out of the 8-bits, only the ATARI version has had any really drastic changed made to its graphics - there are 3D'ish platforms, a very different looking Harry, multi-coloured piles of corn, very differently styled ladders, and even an info panel with fully painted background with a few shades of red. The 3D-look for the platforms doesn't suit the game much, at least without proper shading, because it makes the game look a bit messy. 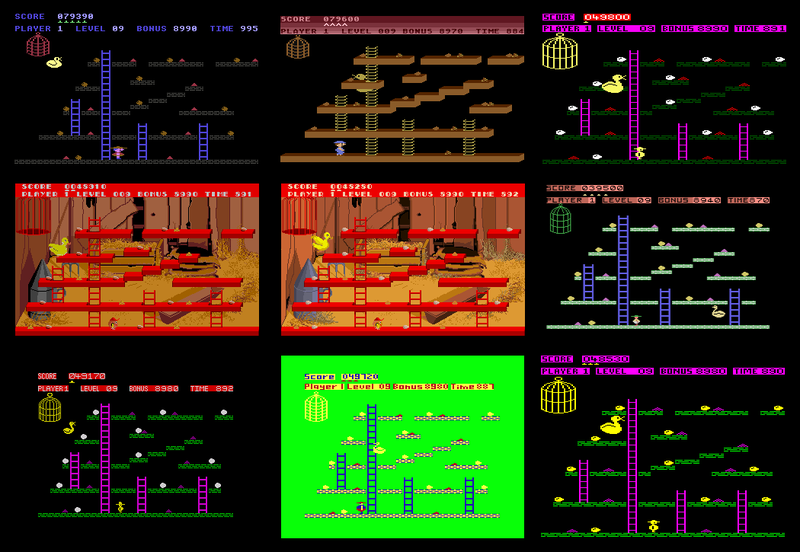 Various versions' screenshots from left to right: Atari ST, Commodore Amiga, DOS CGA, DOS EGA. The 16-bit versions feature more of this unexpected three-dimensional nonsense, but at least the AMIGA and ST versions have the shading part done properly. For some reason, the isometric depth aspect from the 3D platforms was taken off from the DOS version, and you can only see two sides of them. 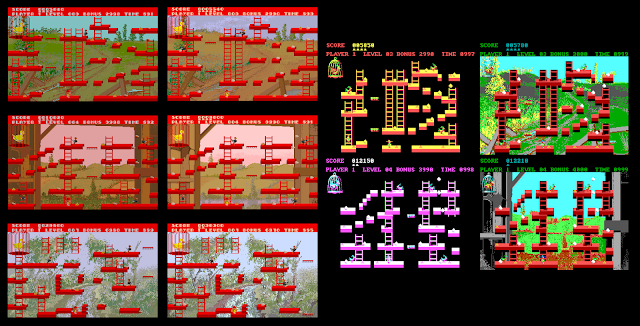 This makes the EGA graphics often look kind of sloppy, because the ladders sometimes seem to connect to platforms that they're not supposed to. In the CGA mode, there is no background picture like in the EGA mode, so the graphics are much clearer there. The EGA mode doesn't allow for enough colours to be used in order to make all the action look good. The greenish-red hens often seem to vanish in the backgrounds. But there are some aspects in the 16-bits that have my approval. The amount of detail is staggering, and the colours on the AMIGA and ST versions are quite well chosen. I particularly like the piles of corn finally looking like piles of corn. Although the AMIGA and ST versions look similar enough on first glance, there are some clear pointers from which you can make out, which one is which: the eggs are brown on the ST, instead of white, the background images are coloured more subtly and realistically on the AMIGA, and the mother duck on the ST has less details. Speaking of the duck, the DOS version has a rooster in the cage instead. Of course, I must still mention that Hen-House Harry looks like Mr. Potato Head on the AMIGA and ST versions. How queer! Commodore 64, Atari 8-bit, Amstrad CPC, Atari ST, Commodore Amiga, MSX, ZX Spectrum, Dragon, Acorn. All the game's eight levels have their differences between certain versions, as you might have gathered already, so I shall end the in-game graphics comparison by returning to level 1, more particularly its first variation, where your only enemy is the homing mother duck. There are two basic varieties of the duck - one which moves in, for the lack of a better word, steps, and the other which moves smoothly. Although I cannot confirm one way or the other of the DOS version, apart from the C64, MSX and 8-BIT ATARI versions, all the rest feature nudgy duck movement. All variations of the duck are animated to open and close their mouth rhythmically, as well as change their facing to the general direction of where you are located. Most of the ducks are simple yellow monochrome sprites, the AMIGA and ST versions have more colours and details, and the DOS version has a rooster, which you already saw earlier in his cage, but I haven't been able to free him yet. From what I know, the 8-BIT ATARI's duck is the only one that flies behind, or perhaps inside the platforms, instead of in front of all the other graphics. Entering your name on the high scores table. Top row, left to right: Atari 8-bit, MSX, Commodore 64. Middle row, left to right: Commodore Amiga, Atari ST, DOS CGA, DOS EGA. Bottom row, left to right: ZX Spectrum, Dragon 32/64, Acorn BBC Micro/Electron. There is no ending in Chuckie Egg - it just loops indefinitely with some variations, as I pointed out earlier. So, the only ending you will get is a Game Over screen, with a possibility to type your name on the high scores table. Depending on the version, this occasion differs surprisingly wildly - if not in any other way, then at least in the number of letters you can write on the scoreboard - but still, it's just text, so I won't be giving much consequence to it. I guess there's only one way to end this section, and that is with obviousness. Although much of the original graphics' style has been thrown away in the 16-bit versions, it was probably necessary due to the rather drastic changes, which made the original colouring and lack of detail unfitting. The AMIGA and ST versions easily take the first place here, but I'm not so sure about the DOS version, which botches up the whole 3D-idea and offers two vastly different graphic modes, neither of which really fit the game all that well. Still, it's not as boring as the 8-BIT ATARI version, which offers no variations in colour, and where the largely unnecessary 3D effect works even less. From the other 8-bits, the ACORN and AMSTRAD versions unfortunately have to be counted as the least impressive due to their overall wider pixels and thus limited level design, but they're still better than the DRAGON version with its truly garish colour choices. The rest are easy enough to figure out. If Chuckie Egg's graphics have never done anything to impress you, then the game's sounds probably feel, for the most part at least, as if they were designed to unimpress you. Still, they provide adequate noise for the background, so it's not too bad. There is not much of music in Chuckie Egg, at least in any of its 8-bit versions. Three out of eight, there is a main title tune, which is a variation on the Chicken Dance. The original SPECTRUM version has a shortened rendition of the tune, which ends strangely with a modulation to a lower key, which sounds very odd. The C64 version features a regular-length rendition of the tune, but it features three oddly placed notes, which are harmonically fitting, but not correct for the melody. Strangely, the DRAGON version is the only one that has a correctly typed-in rendition of the Chicken Dance, but apart from being correct, it's not any more impressive, since all three renditions feature only a single melodic line and no other accompanying instrument. The only bit where you can hear music in all versions is when you lose a life, but not all versions have the same little tune. Most of them do, and even the AMIGA and ST versions have an enhanced rendition of the same little ditty that is featured in most of the 8-bits, but peculiarly, the SPECTRUM version features a four-bar excerpt from a guitar tune called "Romance Anónimo" - anonymous, since the original composer is unknown. Also, the DOS version features a unique melody, but it is so short, I cannot really even call it a proper tune. The little ditty that is featured in all the other versions in some form is probably an original composition from whoever first wrote it, but I cannot be certain of it. Anyway, it sounds like an ending bit for a children's tune that should be played with a banjo. For the 16-bits, the conversion team called for Tony Williams to create a completely new theme tune, as well as an in-game tune. As I mentioned already, the death tune got its own rendition for all 16-bits. Only the DOS version, which was only able to utilise the PC Speaker, would feature a different-sounding theme tune, and no music during play. Even the music in the title screen is low in volume, and can only be heard properly when using a PC with a proper PC Speaker - DOSbox cannot reproduce the proper noises through real speakers. Most of the DOS version's sound effects are much more melodic than in any other version, though, so that's something at least, even though the reason for it is in the sheer difficulty in producing any too difficult type of sound through the PC Speaker. As we're now moving into the sound effects area, it should be pointed out now, that the AMIGA and ST versions play music and sound effects simultaneously, but you can turn the music off from the title screen, if you wish to do so. And of course, the difference between the AMIGA and ST versions is pretty clear, since the AMIGA has a sampler, and the ST has a sound chip with some synth capabilities, but this time, I really cannot be certain, which I prefer more. Chuckie Egg's library of sound effects consists basically of seven different sounds: Harry's walking, climbing ladders, jumping and falling, a different noise for both picking up eggs and corn, and finally, counting the bonus scores from the left-over time. Much of it is simple high-pitched short "pip" noises, short bursts of white noises or similar sounds for collecting eggs and corn, and considering the game's age, obvious long strings of ascending and descending "pip" noises for jumping and falling. There are no particularly big differences in most versions concerning the sound effects, apart from the 16-bits. Only the 8-BIT ATARI version's sound effects are more low-end based and noisier than usual, and the MSX version has a bit more persona than the other 8-bits, with slightly metallic and plonky sound effects. I should probably also mention, that while I cannot be completely certain about the AMSTRAD version's sounds on real hardware, the emulated version had the sound effects played on really low volume, and that's a bit of a problem, considering the said version doesn't have all that much of music to accompany the sound effects. Here's something a bit different... A few months ago, I also received a permission to link videos from Theshadowsnose channel on YouTube. So, this will be the first one of his videos featured on the FRGCB. Although his comparison video of Chuckie Egg doesn't feature all the possible versions (7 out of 11), the interesting thing is that Theshadowsnose uses real hardware and a camera to record his gameplay videos. The versions that are missing from this video are for the IBM-PC compatibles, the two Acorn computers and the Dragon version, but if you're keen on finding out about them, you can easily find footage of all of them on YouTube. That's more like it. The MSX version, once you get used to its problems with heavy repetition, is one of the most enjoyable versions out there, but precisely because of its problems, it cannot win the original. Also, while the C64 version doesn't have the charm of the original, it has more gameplay options and a slightly less ear-grinding set of sound effects. The 8-bit ATARI and DRAGON versions are too slow and uncomfortable for my taste, not to mention not particularly pleasing to look at, and the AMIGA and ST versions are too fast for their own good. And as you know, the DOS version just doesn't work really well in any important area. I'm fully aware that I left out the Tatung Einstein version out of this comparison, so you need not notify me on that issue. The reason for this omission is, because the Einstein was an MSX-clone of sorts, and judging by at least this video on YouTube, the Einstein version of Chuckie Egg is exactly like the MSX version. Therefore, I decided it wasn't worth digging up an emulator for the machine that would run this game properly, because I have had no other use for one so far. Considering that there actually was a conversion of Chuckie Egg for the Einstein, one might assume that other MSX-clones had Chuckie Egg released for them, but I haven't had the energy to find out, since there are so many MSX-clones out there, particularly unknown, rare ones. 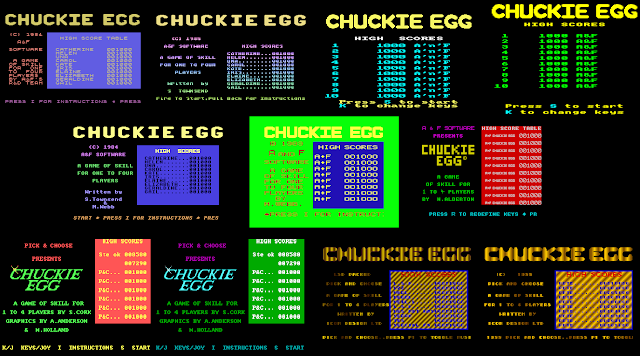 Although Oric.org lists a "Chucky Egg" in their database, an image file of it seems to be impossible to locate, and even so, the database lists it as educational unsorted/junk, published by Oric PD. It's quite possible this unsorted junk thing hasn't survived this long to become digitally preserved, but who knows. 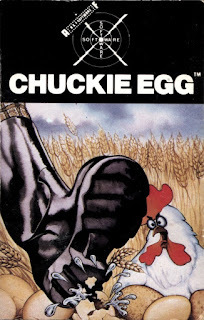 While we're still guessing on that one's fate, Raymond Krug's Chuckford did get a proper release in 1986, and is currently the only Chuckie Egg clone for the Oric-1 that I'm aware of. And it's a fairly basic one, with nudgy movement and hardly any animation at all, but colourful graphics and Scott Joplin's "The Entertainer" as the theme tune. Chuckford also has a vastly differently designed levels, so it offers a very different sort of a challenge, even if the source of inspiration is clear. Being such a basic sort of rendition, it still manages to retain some of the original's feeling and charm, but understandably, it is not as comfortable to play as the real Chuckie Egg. But in Raymond Krug's defence, he wrote it when he was only 14, which I have to say is remarkable! Someone must have not agreed with the game's original title, and tweaked it to be perhaps a little more logical for this remake. But there is a gimmick in this remake, that hasn't been utilised very often for good reasons - a proper 3D engine for what is still very much a two-dimensional platformer. 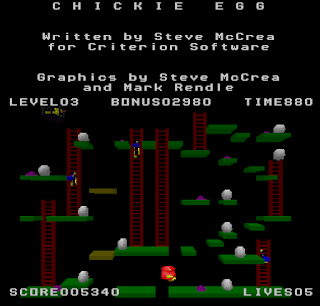 There are also some minor gameplay alterations here, such as the lifts' width to make it next to impossible to drop to the ground when there is a lift below you, but otherwise, Chickie Egg offers very little of substance, as it doesn't have speed options (and the game is quite slow, even of faster machines), and there are no sounds whatsoever. But it is an interesting remake, which would have improved upon further development on at least presentation. This is the first remake of Chuckie Egg that I remember ever seeing, and of course it was made by Retrospec, who specialized in creating plenty of brilliant retro remakes in the previous decade. Although it has to be pointed out, Chuckie Egg - The Next Batch is not so much a straight remake, as it is an homage - an unofficial sequel of sorts, perhaps, but the creator, John Blythe, says that it's really only inspired by Chuckie Egg, instead of being anything more closely related. The thing is, this game doesn't play all that much like the original Chuckie Egg. Sure, the basic idea is the same, but there are notable differences in the game speed and balance, as well as gameplay mechanics. Also, the graphics are more abundant and the music is more modern than anything the official 16-bit versions had. It's worth trying, but I'm not really sure if I like it that much, now that I have invested more time in the original game. Requires closer examination. There was another remake in the making in 2001, but this one never seemed to make it past its beta stage. At least, I haven't been able to find more than this still uncoloured and in many other ways, unfinished version of Chuckie Egg DX for the Game Boy Color, but at least it's still findable. Curiously enough, considering its unfinished state, it's still probably the most playable one of the remakes up to that point, and apart from the screen size restrictions (this was made horizontally scrolling to get the stages to fit properly), it's surprisingly faithful to the original game. At the moment, this clone is the most current one that I'm aware of, and it's an unfinished version for the next-from-the-previous generation Game Boy. Unfortunately, this one is so much more unfinished than the DX beta, that there are no enemies around, no lifts implemented and a very rough collision detection. It has a lot of potential to become very good, but since the latest development stage release was released in 2012, I'm not very optimistic about it ever getting completed. So, that's pretty much it for this little monster. If you can think of any more remakes that I missed out on, do throw us a link in the comments, if you please. And of course, other comments and corrections are welcome as well, but don't get your hopes up on me even attempting to make any alterations to the scores - they are what they are. Anyway, thanks for reading, and I hope that was worth the wait for whoever requested it in the first place! Really cool overview of this game! I do like games like this - reminds me of Donkey Kong. Very informative review for this games. it's make a lots of fun playing this kind of games. The format you write this article is very good.